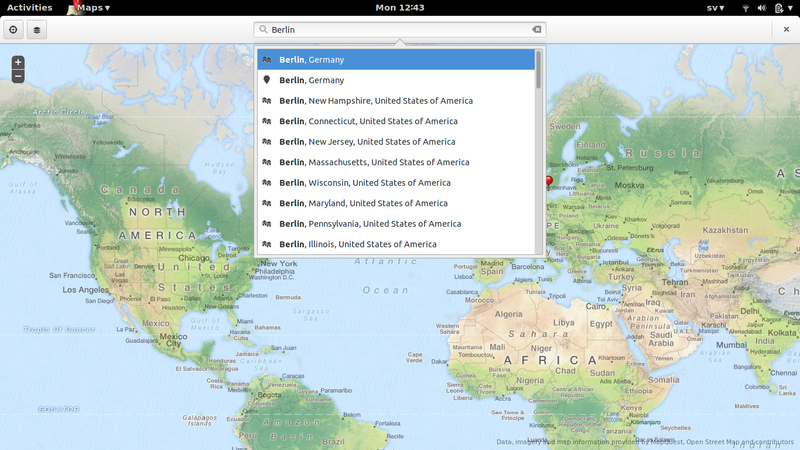 Maps began as a preview in GNOME 3.10 and is still under active development. Two map types are provided, one aerial and one street type. We use the Geoclue D-Bus service to try to pinpoint your location with the most accuracy it can manage. The search-entry will auto-complete. Not against the search server because that would violate the terms of agreement with Nominatim the search service we currently use. 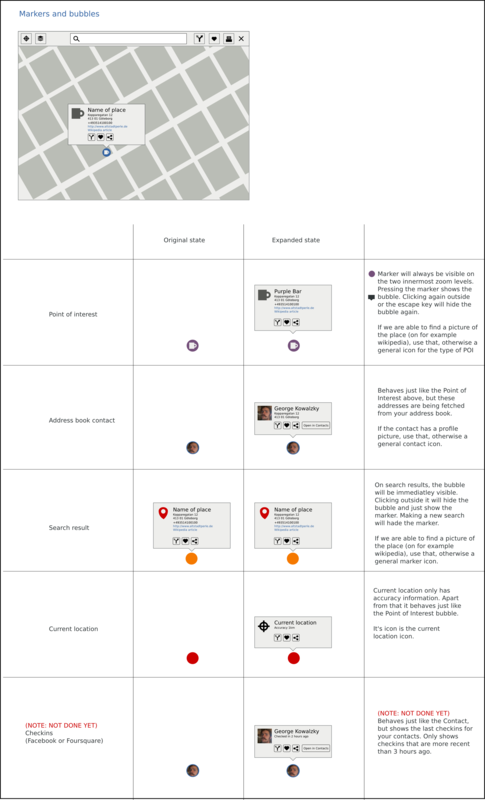 But Maps keep track of the recent-places you have visited and completes against them. And will also complete against bookmarked places and contacts later on. This, among some other things, is what Maps can do today. There are plans and mockups brewing though. And I would like to go through some of them here. There is work under way to provide route search to Maps. This will be done using GraphHopper an open source road routing enginge. Mattias Bengtsson started this project as GSoC project and the patches will soon be under heavy review. 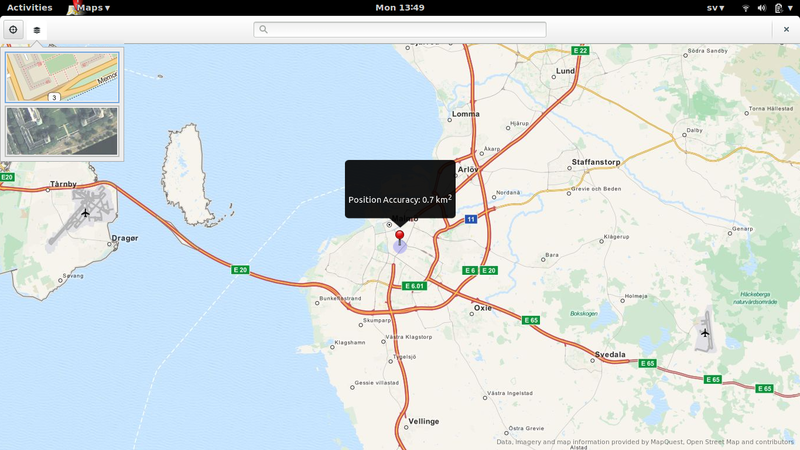 When this has landed Maps users will be able to find routes for car, bicycle and walking. Bug for routing implementation here. 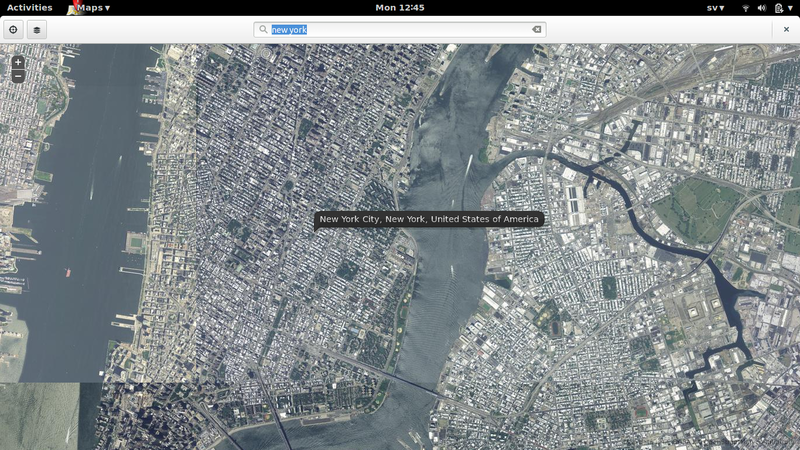 To illustrate how this could look in Maps I have here a video from quite some time a go that demos the functionality. The final result may look different and probably better as well. We also have a GSoC student, Dario Di Nucci, looking into adding support for intermediate points, or via points, to GraphHopper so that we can use them in Maps! Often when you are using a map application you want to actually find out something about the world around you. For instance where the nearest restaurant, ATM, bathroom or pub is located. This is something that Maps also want to do. We have plans of showing you the POI's near you as icons overlayed the map. One idea is that this will kick in at appropriate zoom-levels and show you a small icon that represents, for instance a pub. I have for you a small mockup video of the concept. We have been accepted to this years GSoC and will have student looking in to this. Rishi Raj Singh Jhelumi will be working on this functionality. Both the overlaying of POI icons and figuring out where (which service) to get the POI data from. 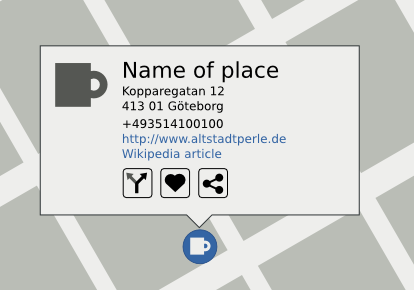 Another idea that we are thinking about is to integrate your contacts in Maps. So that the search auto-completes to the address of your contacts. And also possible having them appear in the same way that the POI's do in the section above. Similar to this is the integration of check-in information. So that you can see on the map where people you are connected to have checked-in using Facebook or FourSquare. We will have a GSoC student working on this as well! Damián Nohales will be looking at integrating this to Maps and also have a look at enriching our map markers to have some actual useful information in a pretty way. Right now we use those little black markers as seen on the screenshot above to mark a place on the map. They do not provide much information about the place and there is really not much you can interact with. Our plan is to replace them with GtkPopovers. Our designers have created some nice mockups for this and you can look at them here. And a sneak preview below, the mockups also contains ideas on how and when different markers should be used. A bug has been filed to Maps asking to add links to GNOME Weather and Clocks, so that one could easily find out time and weather information about a place. A use-case might be. ahead of me going there. This is something that might be coming to Maps, but the designers have not yet provided any feedback on the idea. Beyond, search, editing and custom maps? As mentioned above the search service Nominatim does not allow us to auto-complete against the search results. This could be dealt with by hosting our own instance of Nominatim, or looking elsewhere for searching. until you zoom enough) or they are very difficult to use. Another thing I think would be cool for Maps is an easy way to create custom overlays for Maps. To Show interesting data with geo connection. Like the infant mortality rate per country, unemployment per Swedish municipality or maybe GNOME contributors density. If you have any ideas of features that will not distract from the goal of being a simple map application foremost, please contact us and/or get involved!